Tens of thousands of South Sudanese are fleeing their homes after inter-ethnic clashes around the town of Pibor. The UN is warning villagers to run for their lives as some 6,000 fighters advance on their ethnic rivals. Fighters from the Lou Nuer ethnic group are pursuing members of the Murle community, reports say, as a deadly vendetta over cattle raiding continues. A UN official told the BBC that peacekeepers and government troops are heavily outnumbered. The government is sending additional police and troops in a bid to quell the violence. About 1,000 people have been killed in recent months as reprisal attacks over cattle raids have escalated. Tens of thousands of Murle fled Pibor after it came under attack from the Lou Nuer on Saturday. BBC East Africa correspondent Will Ross says the Lou Nuer are attacking villages and burning homes and that it could take a week for the Murle to walk to an area of safety. Deputy UN deputy humanitarian coordinator in South Sudan Lise Grande told the BBC that several hundred UN peacekeepers and government troops were "far outnumbered" by about 6,000 Lou Nuer fighters. "Several flanks of the attackers have moved in a south-easterly direction [from Pibor], almost certainly looking for cattle," she said. Media captionThe UN's Lise Grande: "The damage that occurred is lamentable, it's not acceptable"
She said the main part of Pibor had been held but that a clinic belonging to the charity Medecins Sans Frontieres (MSF) had been "overtaken". Ms Grande said the UN was tracking the movement of the Lou Nuer and warning others in their path to "disperse into the bush for their safety". Our correspondent says many of the Lou Nuer fighters were now believed to be in pursuit of the Murle who had fled Pibor. The BBC has learnt that some of the displaced - mainly women, children and the elderly - have been killed although it has not been possible to verify how many. 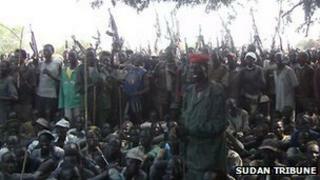 A resident of Pibor who fled to the capital Juba told the BBC that the Lou Nuer were still occupying parts of the town. "The UN troops are there but they are not fighting the fighters who entered the town," said Rev Orozu Lokine Daky of Pibor's Presbyterian Church. "They are just trying to protect the city centre only, the rest of the town is now under [the control of] the fighters. "The situation is deteriorating. My own mother and my own sister are now missing. I don't know where they are. I assume they are dead," he added. South Sudan's President Salva Kiir has called on the Lou Nuer to stop their advance and return to their traditional areas. The government said it was deploying more troops and an additional 2,000 police to Pibor. Military spokesman Col Philip Aguer said on Sunday: "The 2,000 police are being sent within the next 24 hours. Troops will be deployed as soon as possible." MSF said it had lost contact with some 130 of its staff in Pibor and was "extremely worried" about their safety. The MSF workers were believed to have fled into the bush when Pibor came under attack. The medical charity's head in the country, Parthesarathy Rajendran, told the BBC they had only been able to get in touch with 13 members of the MSF team in the town. The Lou Nuer fighters have arrived in Pibor after marching through Jonglei state in recent weeks, setting fire to homes and seizing livestock. The entire town of Lukangol was burnt to the ground last week. About 20,000 civilians managed to flee before the attack, but dozens were killed on both sides. The governor of Jonglei state and the vice-president of South Sudan have been trying to mediate between the rival ethnic groups. South Sudan became independent on 9 July 2011 following decades of civil war with the north. One legacy of the conflict is that the region is still flooded with weapons. These are now being used in ethnic power-struggles, which often focus on cattle because of the central role they play in many South Sudanese communities.